Vice President and Prime Minister and Ruler of Dubai, His Highness Sheikh Mohammed bin Rashid Al Maktoum, said today that the private sector is a key partner to the public sector in the UAE’s economic development growth and in the country’s ambitious vision for comprehensive development. Sheikh Mohammed made the remarks while visiting the IMG Worlds of Adventure, the world’s largest indoor theme parks, which opened today in Dubai. He was accompanied during the visit by H.H. Sheikh Hamdan bin Mohammed bin Rashid Al Maktoum, Crown Prince of Dubai, H.H. Sheikh Maktoum bin Mohammed bin Rashid Al Maktoum, Deputy Ruler of Dubai. Commending the solid investments that have driven economic growth and development, Sheikh Mohammed said that the public-private partnership is a key pillar in building the nation and realising the people’s aspirations. He added that private sector investment in major projects plays an important role in enhancing the UAE’s leading position as a model for development, and boosting its attractiveness for local and foreign investors. He referred to the remarkable developments in the hospitality, leisure and tourism industry sectors, which are key economic pillars that supports the UAE Vision 2021 and the National Agenda, which aim to make the UAE the region’s economic, tourism and trade capital. 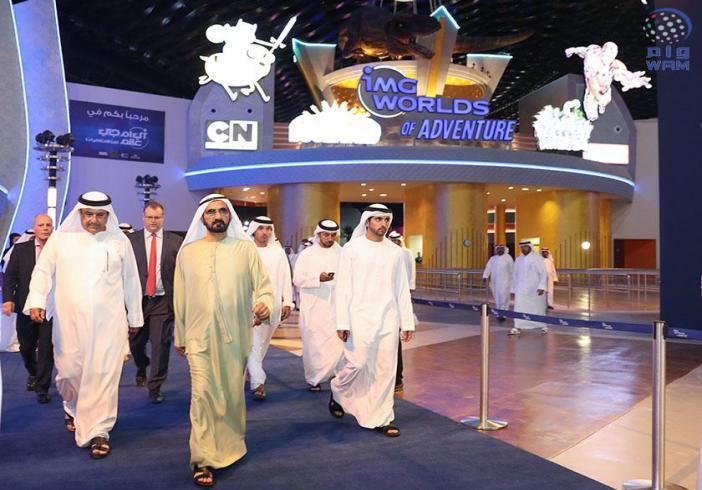 The AED3.7 billion IMG Worlds of Adventure is wholly owned by the Ilyas & Mustafa Galadari Group, and stretches over an area of 1.5 million square feet, making it the largest indoor theme park in the world. Among others present were Mohammed bin Abdullah Al Gergawi, Minister for Cabinet Affairs and The Future; Khalifa Saeed Sulaiman, Director-General of Dubai’s Protocol and Hospitality Department; Helal Saeed Almarri, Director-General, Dubai World Trade Centre Authority and Dubai Department of Tourism and Commerce Marketing (DTCM), and Mohammed Al Habbai, Dubailand CEO.